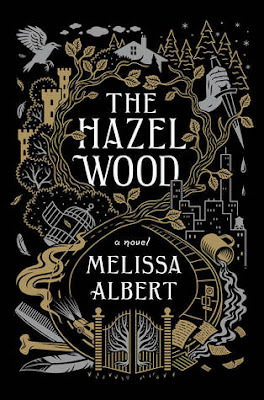 The Hazel Wood takes a page from traditional Fairy Tales, with it’s dark and twisty story. I loved, loved the writing style of Melissa Albert. It has that lyrical quality that makes you want to just read anything she writes. The plot is fantastic as it is dark. It left me with that feeling when I was finished reading that even though the story was done, you still feel an attachment to it. I admit, the story had a slow start for me. I think I just lack patience anymore. I’m ready to get moving, like I want to climb into the story and go searching for things. Like a particular book. The writing, however, was perfect all the way through. So even though it felt slow starting, I enjoyed the writing so much that I would have kept reading anyway. Which of course I’m glad I did, because once it picked up. I was hooked. It’s hard to find a way to describe the plot because there are so many different components. The more that Alice tumbles down her own rabbit hole. The more stones are overturned. I loved the way that the Fairy Tales are woven into the plot and the fact that it’s Tales of the Hinterland. So it’s not stories that we, as the reader, have heard before. So every little scrap of information is like one that you are starving for, just like Alice. It’s one of those tales that leaves you feeling a little haunted after reading but you don’t want to go into much depth about in order to keep from giving anything away. Alice and her mother, Ella are nomads. They move from place to place and it’s not as if they are running from someone in particular. To Alice, they are running from bad luck. Alice dreams of getting to know her famous grandmother Alethea Porsepine, but her mother Ella wants nothing to do with the past. Alice is such an interesting character because she doesn’t seem bitter about moving, I think she has adopted this idea that Ella is all she needs. That they find strength in one another. So when her mother is taken, it’s a whole new world for Alice to have to possibly rely on someone else for help. Her character growth and her relationship with Ella is one the really interesting parts of the book. Ellory Finch is rich, which I think sometimes Alice uses that against him. He’s also a super fan of her grandmothers stories and her best resource to finding her mother. They go from an tentative acquaintance to a stronger bond as they travel together. I liked him, he was different. If you are a fan of Fairy Tales, this is one for you to definitely read. If you are not, read it anyway because it’s not a retelling of the tales you know.